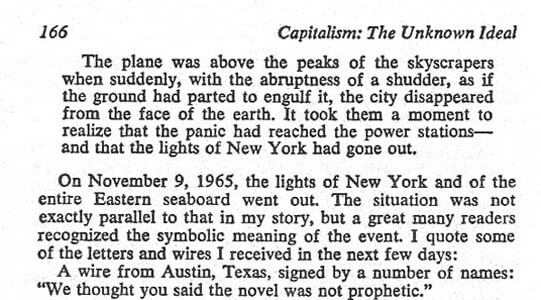 I was thrilled to discover that Ayn Rand, one of my heroes, had quoted my telegram above that I initiated and wrote while a student at The University of Texas. She had even given it top billing over 5 other wires and letters. Yet, because of a ground rule in selecting my 50 favorite books, Capitalism: the Unknown Ideal did not make the list below. I own the publishing contract document for Capitalism which was signed by Ayn Rand and Nathaniel Branden. One of enjoyable aspects of a personal website is sharing your favorite books. They represent an intellectual fingerprint and a trail of personal development. I believe I'm the only person who has read all 50 of these books. How many of them have you read? It is an insightful exercise to make a list of your favorite books and notice the common denominators. I did limit entries to one book per author. This was a hard decision because I have read and enjoyed all of the books of Ayn Rand, Barbara Tuchman, James Clavell and others. My favorite books are listed in alphabetical order by title. They are linked to Amazon.com in case you want more details or to buy them. The authors names are linked to Wikipedia. There are a number of masterpieces on this list and it gives me great pleasure to share them with you. You can compare my list with the list of the best fiction and non-fiction from the general public and experts at the Modern Library website. 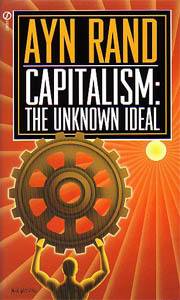 Atlas Shrugged Ayn Rand Novel Rand's magnus opus. A brilliant epic demonstrating how philosophy works in the world. Second only to the Bible in one poll of influential works. The Adventures of Huckleberry Finn Mark Twain Novel Incomparable tale of a boy growing up in the 19th century and discovering values. American Caesar: Douglas MacArthur William Manchester Biography Incisive and compelling biography of a colossal figure who is my distant cousin. Autobiography of Benjamin Franklin Benjamin Franklin Autobiography A book illustrating how to improve yourself by one of America's greats. The Bonfire of the Vanities Tom Wolfe Novel Sparkling social commentary on compemporary America. You will laugh out loud. Bury My Heart at Wounded Knee Dee Brown History "Tell them that the Indians had their heroes too". Call of the Wild Jack London Novel Tale of survival in Alaska. Life and death decisions. A book for a boy. Chaos James Gleick Nonfiction Explanation of non-linear systems. Educational and insightful. Cheaper by the Dozen Frank B. Gilbreth Autobiography Classic story of the efficiency expert who applies those principles to raising 12 children. Funny. Chrestomathy H. L. Mencken Essays Mencken selected these essays as his best. Brilliant thinker and writer. The Codebreakers David Kahn Nonfiction The encyclopedia history of cryptography including impacts on WWII. Complete Book of Marvels Richard Halliburton Autobiography Book of adventures all over the world. I read this when I was 10 and it changed my life. The Day of the Jackal Frederick Forsyth Novel A thriller about an assassination plot against Charles DeGaulle. Spellbinding with attention to detail. The Decline of the West Oswald Spengler Theory of History An seminal analysis of history filled with brilliant insights. The Descent of Woman Elaine Morgan Nonfiction Key concepts lead you to a paradigm shift on how pre-history worked. Earth in Upheaval Immanuel Velikovsky Nonfiction Theories of the history of planet Earth. Full of insight. Readable. The Economic Consequences of the Peace John Maynard Keynes Nonfiction The prophetic analysis showing that the treaty of Versailles would lead to WWII. The Enigma of Japanese Power Karel van Wolferen Nonfiction Breathtaking insights into the inner workings of Japanese society. Controversial. The Enjoyment of Living Max Eastman Autobiography Intellectual journey to communism and then to anti-communism. Highly personal and revealing. The First Immortal James Halperin Novel The novel about how science may lengthen the human life span to infinity and the implications. For Whom the Bell Tolls Ernest Hemingway Novel Exploration of human motivation against the setting of the Spanish Civil War. He is my distant cousin. The Godfather Mario Puzo Novel The sweeping and seductive tale of the code of honor of the Mafia. Guns, Germs and Steel Jared Diamond Theory of History Brilliant and benevolent insights on the development of prehistory. All who have read this book on my recommendation have thanked me. The Guns of August Barbara Tuchman History The engrossing account of the causes and opening drama of WWI. The History of the English-Speaking Peoples Winston Churchill Nonfiction All 4 volumes of this monumental work are a sheer pleasure to read. He is my distant cousin. The Hunt for Red October Tom Clancy Novel A techno-thriller about an incident during the cold war. Im Westen Nichts Neues Erich Maria Remarque Novel Original German version of "All Quiet on the Western Front". A young man's coming of age in WWI. Lincoln: a Novel Gore Vidal Historical Fiction Provides an intimate view of Lincoln as a master political stratigist. You will laugh out loud. Mein Kampf Adolf Hitler Autobiography Background for understanding what happened in Germany and Europe in the 20th century. The Name of the Rose Umberto Eco Novel Mystery set in a monastery in the middle ages that explores Christian dogma and values. A Night to Remember Walter Lord True Story The gripping narrative of the sinking of the Titanic. Lord uses many details learned from survivers. Nineteen Eighty-Four George Orwell Novel Timeless warning of the dangers of totalitarianism. Of Plymouth Plantation William Bradford History One the most important books of the 17th century. It is essential reading to know the history of the Pilgrims and understand the origin of American values. Papillon Henri Charriere Autobiography Story of the human spirit triumphing in spite of the horrors of Devil's Island. The Pillars of the Earth Ken Follett Novel Captures the human spirit in the 12th century via a master builder of a cathedral. The Red and the Black Stendhal Novel One of the great European novels of the 19th century. A classic tale of ambition and hypocrisy. The Rise and Fall of the Third Reich William Shirer History The monumental and definitive history of the Third Reich. The Rising Sun: The Decline and Fall of the Japanese Empire John Toland History Pulitzer Prize­winning history of World War II which explains Japanese thinking and strategy. The Scarlet Letter Nathaniel Hawthorne Novel The classic tale of adultery in Purtain New England. Seven Pillars of Wisdom T.E. Lawrence Autobiography Brilliant and moody book on which the movie Lawrence of Arabia was based. Shogun James Clavell Historical Fiction The story of Japan and the first contacts with the west. Intricate, insightful and powerful epic. Siddhartha Hermann Hesse Historical Fiction The story of the life and self-discoveries of the Buddha. Slow, sensitive and sad. Something of Value Robert Ruark Novel The powerful story of the Mau Mau uprising in Kenya in the 1950s. Think and Grow Rich Napoleon Hill Nonfiction Hill interviewed 400 of the most successful people in the 1920s and distilled their secrets. Timeless. To Kill a Mockingbird Harper Lee Novel Exploration of values in a small southern town during the depression as seen thru the eyes of a child. An American classic. Uncle Tom's Cabin Harriet Beecher Stowe Novel Powerful, widely-read, anti-slavery novel which inflamed Northern opinion and helped lead to the Civil War. She is my distant cousin. Undaunted Courage Stephen Ambrose Nonfiction The brilliant saga of the Lewis and Clark expedition. Lewis was basically the son that Thomas Jefferson never had. War and Peace Leo Tolstoy Novel The great Russian Novel of the Napoleonic war. Long, slow and Russian. When the Lion Feeds Wilbur Smith Historical Fiction The sprawling tale of the founding of South Africa. Zen and the Art of Motorcycle Maintenance Robert Pirsig Autobiography An exploration of values which creeps up on you with explosive impact. Click for background info.